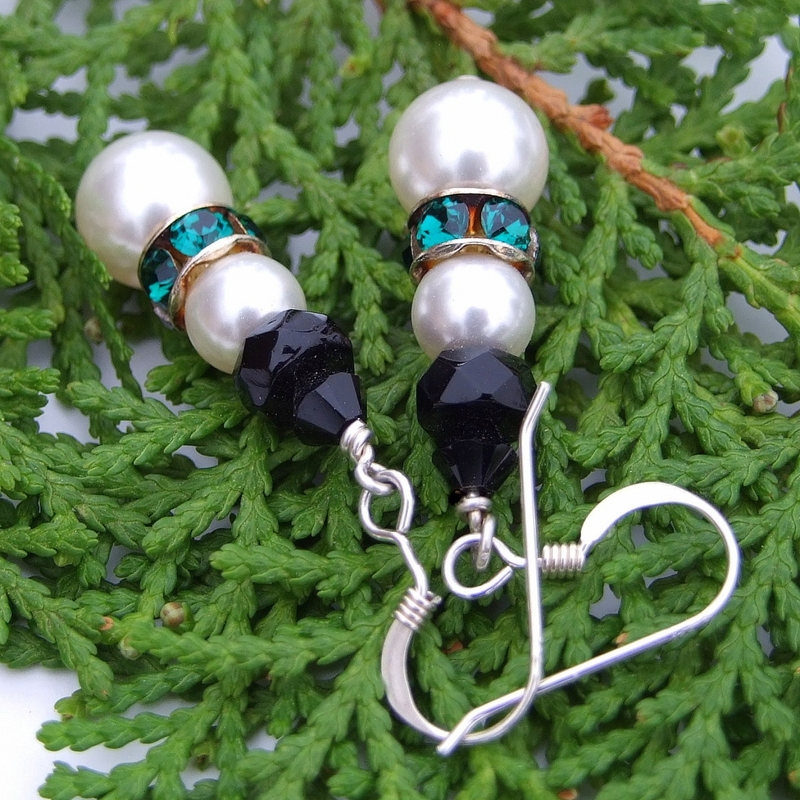 Sparkling snowmen earrings are such a joy to wear for the Christmas season and well beyond into the depths of winter. 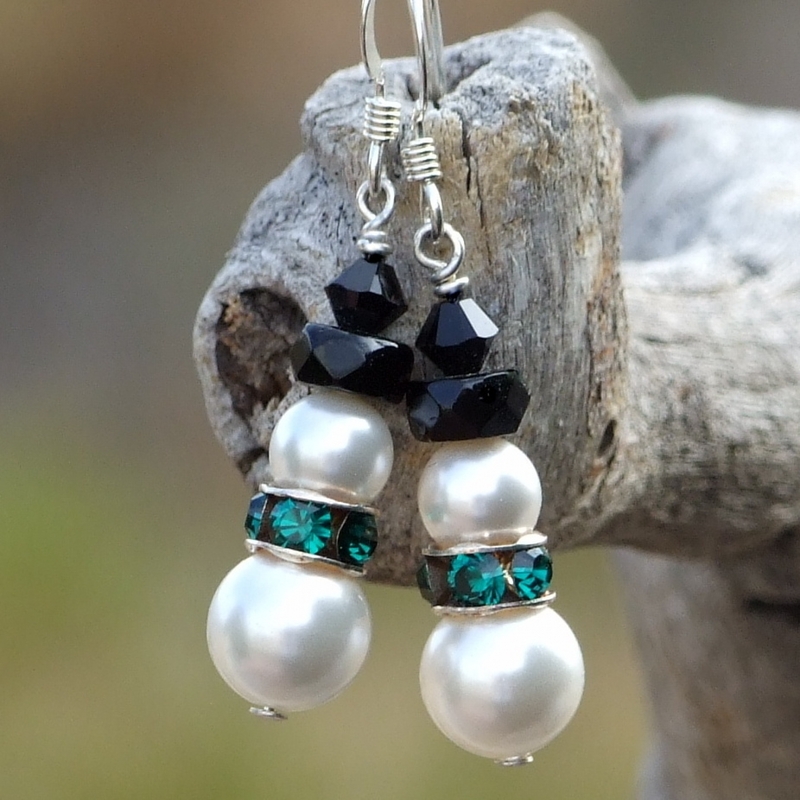 These fun snowman earrings, perfectly named SNOWMEN IN EMERALD, were handmade with luminous Swarovski crystal pearls. Glittering emerald green Swarovski crystal "collars," black Swarovski crystal rondelles and bicones, and sterling silver all come together to create the handsome snowmen. You will want to flaunt these dapper earrings at your fancy Christmas parties, at work or during a casual weekend with good friends. 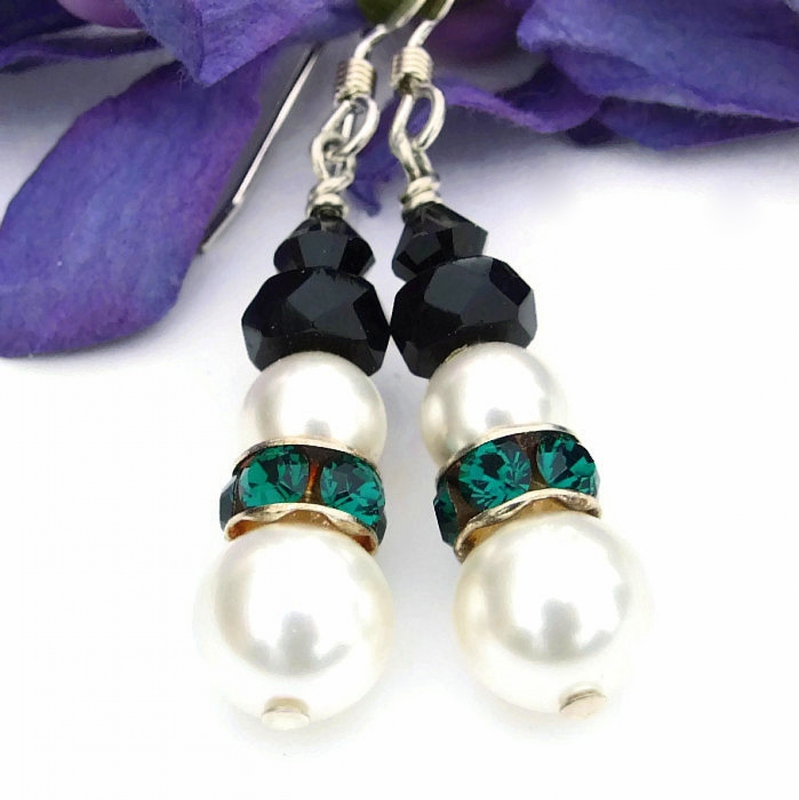 Whimsical and smile invoking, the SNOWMEN IN EMERALD earrings were carefully designed and handmade by Catherine of Shadow Dog Designs for the woman who adores elegant holiday jewelry. 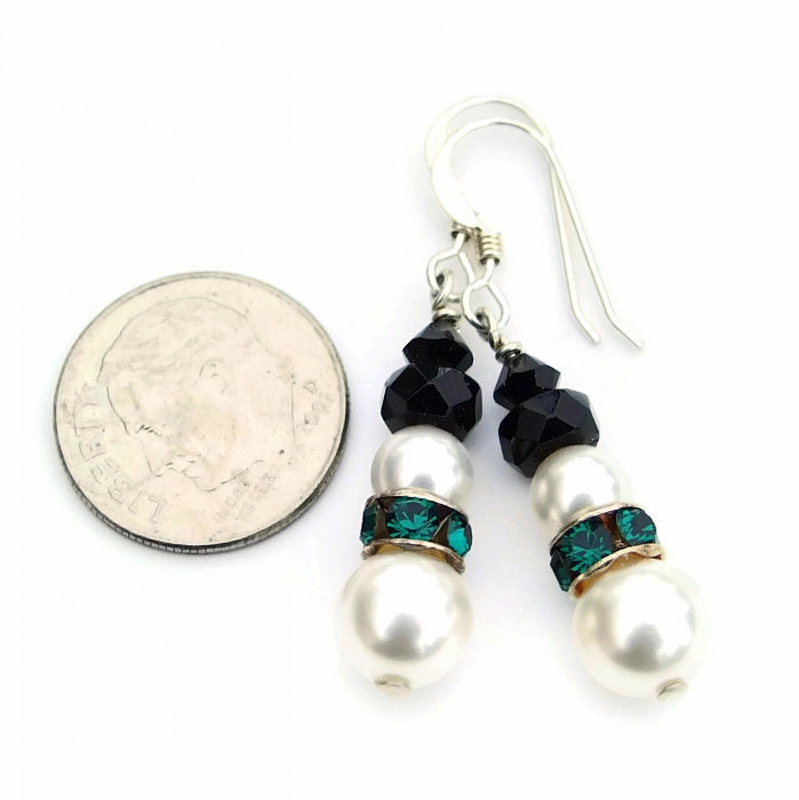 ​ *** For a better understanding of the relative size of the SNOWMEN IN EMERALD earrings, please be sure to check out photo #5 for a size comparison with a dime. 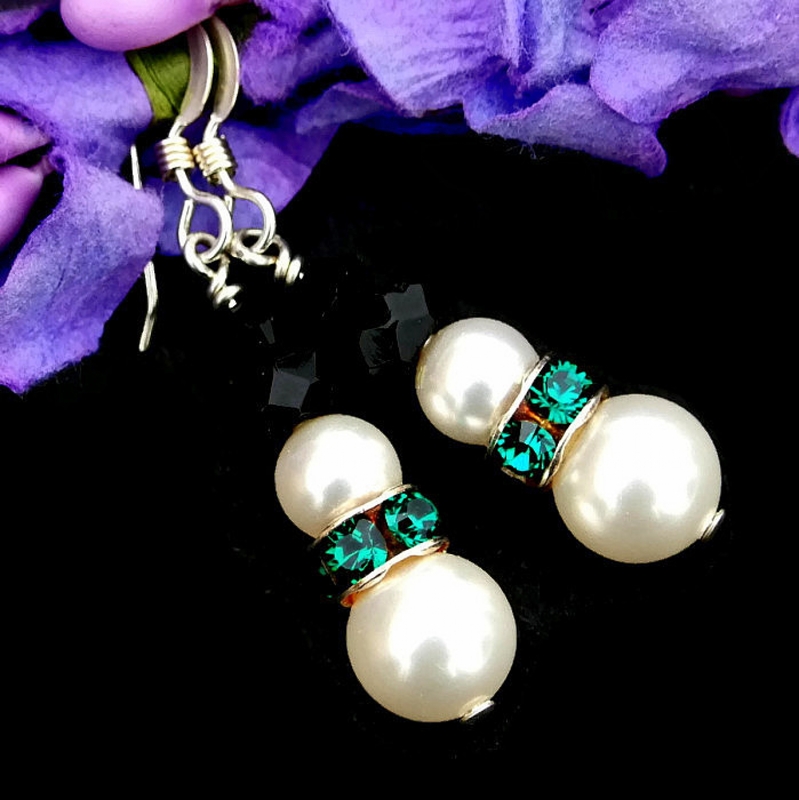 To make the body of the sparkling SNOWMEN IN EMERALD earrings, two different sizes of Swarovski crystal pearls were used: 6 mm for the head and 8 mm for the lower section. 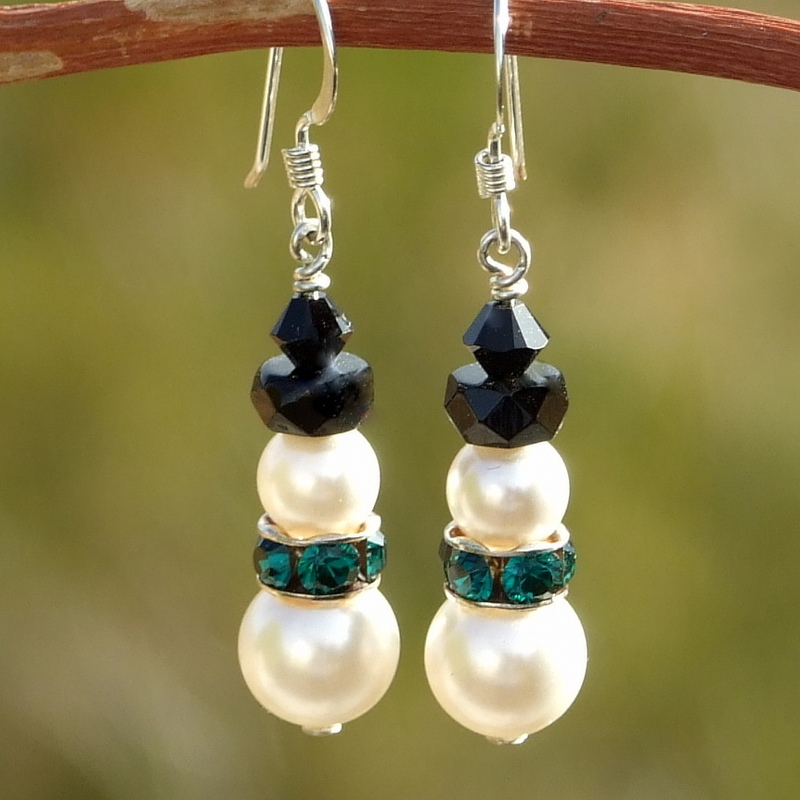 Swarovski crystal pearls are a manmade pearl, but, unlike many synthetic pearls that use a hard plastic core, Swarovski crystals have a lead crystal core. Because of the crystal core, the pearls mimic the weight of real pearls and, as real pearls do, warm to the skin when worn. To give the look and feel of famous South Sea pearls, multiple layers of pearlescence (crushed pearls) are added one layer at a time. That is why you get the luminous quality that you can see in the photos. And if they are that gorgeous in the photos, just imagine how much more beautiful they are in real life hanging from your ears! All well dressed snowmen need a fancy collar, these cuties included. A Swarovski crystal encrusted silver plated brass roundelle was added to each snowman between the head and body of the snowmen. The six faceted emerald green that add sparkly goodness to the collars might be small at 4 mm but they sure twinkle up a storm when the light hits them! It’s too bad the photos don't allow the famous Swarovski sparkle to show. Snowmen need top hat and these have one. To create the top hats, two different types of Swarovski crystals in jet black were used. Faceted Swarovski crystal rondelles make up the brim of the hat. The crowns were created with 4 mm faceted Swarovski crystal bicones. Sparkle aplenty! The body of the earrings were strung on sterling silver head pins. The top end of the headpin was carefully wire wrapped into a loop. The loop was then then connected to sterling silver French hook earwire, a perfect finish to a fun pair of snowmen earrings. The SNOWMEN IN EMERALD earrings will be carefully packed in an organza jewelry bag, perfect for gift giving to a loved one . . . or to yourself!